MOSCOW, Idaho – With little more than a week to go before its season-opening game with Fresno State, Idaho loosened the training wheels a bit Friday. A brisk, 70-minute scrimmage had less to do with individual performances under the sharp scrutiny of position coaches hovering nearby than it did with getting the right personnel groups on the field to run specific offensive and defensive packages. “I’ll know more in two hours, when I see the tape. But I did not see a whole bunch of assignment errors,” Petrino said. The workout was not devoid of highlights. On the first play, junior quarterback Mason Petrino loaded up and hit wide receiver Jeff Cotton in stride with a pass covering nearly 40 yards. 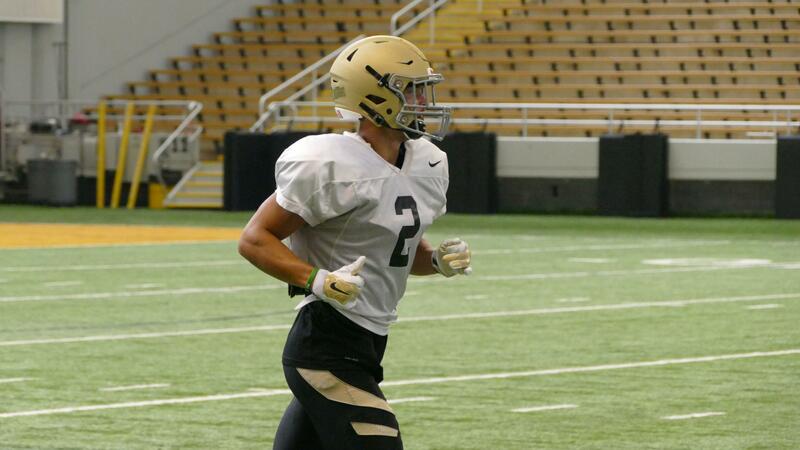 Also from the 37, Mason Petrino connected on a touchdown pass with Idaho’s two-way phenomenon senior Kaden Ellis. On the next series, he hit redshirt freshman wide receiver Curtell Haywood for a score. Elliss’ busy night, in addition to offense, had him playing with the first-team defense, primarily as a pass rushing buck linebacker. In that capacity, he gave freshman quarterback Nikhil Nayar a first-hand experience of what elite speed coming off the corner looks like. Elliss stripped Nayar on one play and later in the scrimmage hurried him into an incompletion. The field-goal unit didn’t get any work, but the kickoff and punt teams did. Noah Croninger, a redshirt junior, will handle kickoffs this year, and he consistently put the ball in the end zone. Preseason All-America Cade Coffey returns as Idaho’s field-goal kicker and punter. Jalen Hoover, a sophomore safety, and Tre Walker, a freshman linebacker, combined to block one of Coffey’s punts. For the final part of the practice, the No. 1 offense and defense each worked specific down and distance narratives against reserves. On a night when the Vandals opened their volleyball season against Santa Clara and fans poured in to Memorial Gym, 15 people were on hand for the opening kickoff of the football scrimmage in the Kibbie Dome. Despite the sparse audience, Petrino said his team delivered what he was looking for in the way of commitment. Published: Aug. 24, 2018, 10:35 p.m. Updated: Aug. 25, 2018, 7:42 a.m.